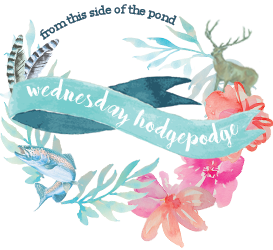 It's Wednesday, time to Hodgepodge! Check out Joyce's post here if you'd like to join in. 1a. Staying cool - heat and humidity are not my friends so I stick close to home in the summer. Vic is traveling a great deal so there's not really anywhere to go if my field trip partner isn't by my side. 1b. House Hunting - The move to Washington is just a few months away so we are surfing the Internet researching house plans, neighborhoods, commuting distances, and all that comes with house hunting. We'll be taking a buying trip in the late summer or early fall. 1c. Volunteering at the gift shop - I picked up extra shifts because many of our volunteers are moving or have children out of school. Must.keep.checkbook.at.home.on.volunteer.days! So much temptation. I covered this at length in my Summers of the Past post. We spent every weekend in the summer for six years at our caravan on the beach. Backyard, but not for too long (see 1a. above). Conservatory would be my pick, but with glass not screens so it could be air conditioned. Yes, I read food labels. I am deathly allergic to carageenan and food manufacturers sneak it in all kinds of things. Why on earth would it be needed in cut-up rotisserie chicken? I prefer to buy local and use the Dirty Dozen app to know what fruits and vegetables must be organic. Happy by Pharrell Williams - Happy that this is our last summer in southeastern Virginia! I am appalled at the rudeness and sheer viciousness of some commenters on You Tube. I watch a couple of vlogs regularly - Day in the Life types, shopping hauls and gift-giving ideas, home organization. I can't believe that some people feel it necessary to be so hateful. Really, these vlogs are for information purposes - a vlogger wants to share so if it's not something that interests you, or you agree with, or you like, just move on. Why bother to watch the vlog and then comment that the vlogger has more money than sense or is professing to be an expert when they are simply sharing their experience? If you can't say something nice, don't say anything at all. Good luck on the house hunt!!! That is always stressful but also so very much fun!!! I agree with people saying horrible things; the same holds true on facebook! We need to go back to "if you don't have something nice to say then say nothing at all"
Oh, my! I did not realize that about the vicious commenters on You Tube. I watch a few vlogs of the type you mentioned, but not on a regular basis. I am not on Facebook at all and have no desire to be, but I have heard it is much the same, and Ann confirmed it above. What in the world is wrong with these people? That must be very hard having to watch out for carageenan. It is in so many foods, as you mentioned. I enjoyed reading your answers today. Have a wonderful week!